Item # 299779 Stash Points: 2,199 (?) This is the number of points you get in The Zumiez Stash for purchasing this item. Stash points are redeemable for exclusive rewards only available to Zumiez Stash members. To redeem your points check out the rewards catalog on thestash.zumiez.com. Grab, tweak, and shred with the mobility and ease of the Ripper Tripper Dye Pipe Snowboard Gloves from Neff. Featured in a black and pastel tie-dye colorway, the Chameleon glove is a low-profile glove that's great for skiing or snowboarding. Made from a neoprene and PU coated mesh, the Ripper glove offers up water-resistance and breathability, without sacrificing mobility. 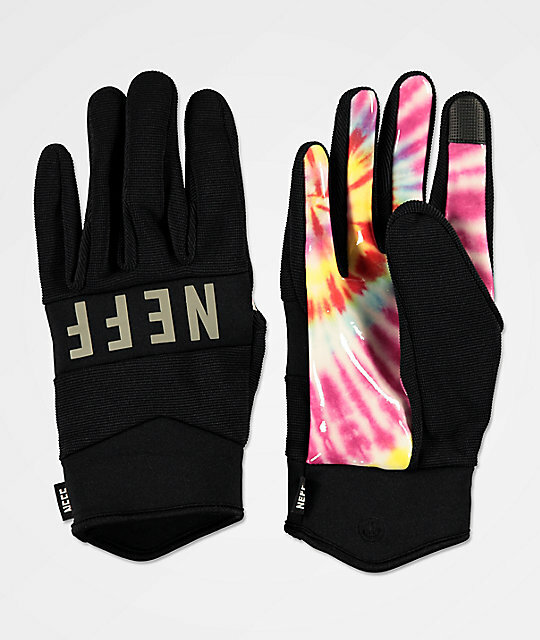 Ripper Tripper Dye Pipe Snowboard Gloves from Neff. A neoprene & mesh mixed fabrication coated with PU for mobility & water-resistance. Palm: An abrasion-resistant & waterproof synthetic leather palm with full silicone coating in a black & tie-dye pattern. Pipe and park gloves for skiing and snowboarding. Ultra-soft brushed fleece lining for warmth & comfort. Hook & loop cuff adjuster tab with extended palm side cuff for easy entry.